Eirene Greek goddess of peace was said to be the daughter of Zeus and Themis. She was one of the Horae, and her sisters were Eunomia (goddess of order, law and legislation) and Dike (goddess of moral justice). The Horae were also goddesses of the seasons (spring, summer and autumn in Greece) and Irene was the goddess associated with spring and all things blooming. She was represented with a cornucopia, a sceptre and a torch. In art, she was depicted as a beautiful young woman. In one of the most famous statues from the Greek antiquity, Eirene Greek goddess of peace holds in her left arm baby Ploutos, the god of wealth and plenty. This statue was sculpted by Cephisodotus the Elder (father of Praxiteles) and was located in the agora of Athens, to celebrate the Common Peace of 371 BC (i.e. peace between all parts involved in a war, not just bilateral peace established between two cities). This statue was a reminder for everyone that properity flourishes when there is peace. In Aristophanes' comedy called Peace, Trygaeus, a citizen of Athens, flies on a giant dung beetle to the house of the gods in heavens, because he wants to plead with them to restore peace on earth. There, he only finds Hermes, who tells him that the other gods are sick of war and of the prayers of the mortals and just went away. Only Polemos (War) lives there now. He imprisoned Peace in a cavern and we wants to grind all Greeks to paste, in a giant mortar. When War goes looking for an adequate pestle, Trygaeus calls all Greeks to come and free Peace. All kind of Greeks, from many city-states, come to the rescue. Those who work most are the farmers, because they are those who appreciate Peace more. In the end, Eirene/Peace is freed, but she does not want to speak to the Greeks: she is angry with them because they made her suffer. She whispers in Hermes' ear that she offered Greeks truces, many times, but they all spoke in the assembly against her and in favour of War. Trygaeus apologizes for all his countrymen. When he returns on earth, Trygaeus prepares a sacrifice for Eirene Greek goddess of peace, but a slave tells him not to kill the lamb on the goddess' altar, because she hates to see blood. The Chorus sings about how nice it is to spend winter afternoons with friends, in front of the fire and enjoying the good life in times of peace, as opposed to having to do the regimental drill in times of war. Now, that Eirene came back to Greece, the businesses of the sickle maker and of the jar makers flourish again, while those who make weapons and war equipment should reconvert their object: Trygaeus suggests that spears should be turned into vine poles, helmet crests should be used as dusters and breastplates as chamber pots! 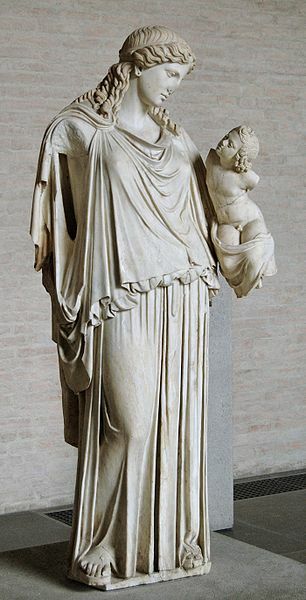 The following is a beautiful statue of Eirene greek goddess of peace with Ploutos, god of wealth, in her arms.